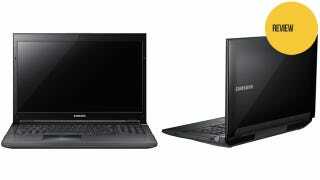 At a hefty 17", the Samsung Series 7 Gamer is not exactly what you might call "portable." It's a laptop that's squarely in the realm of desktop replacement. The system specs say it weighs in at just under 8.4 pounds, but it's still not something you'd exactly want to carry around. When I got it out of the box, everything about it felt ludicrously large. The machine, frankly, is a beast. It is the first laptop in this house (and there have been many laptops in this house) to be larger than the cat. For comparison, I took a quick (if terrible) photo of the Samsung Series 7 Gamer next to an Alienware M14x 14" gaming laptop, which itself is not exactly svelte. Happily, the feel of the thing is actually pretty nice. It may be a beast, but it's a comfortable beast. The plastic around the keyboard isn't rubberized, but it does have a smooth, satiny feel that seems like it would wear well. The size is an advantage when it comes to the keyboard, which features full-sized, responsive keys and a number pad to go with. The default backlighting, a gentle, vaguely-blue white, works nicely as well, creating light and contrast without being garish. And of course, the big advantage of a big laptop is its big screen. The crisp 17" display runs at 1920x1080, delivering nicely on HD gaming. The one exception to the nice feel is the trackpad, which honestly is kind of terrible. The buttons are placed in such a way that I routinely hit right-click when reaching for left-click, the touch-tap is not always responsive, and the texture of the thing created a weird sort of friction drag on my fingers, making me feel like using the mouse pointer was twice as hard as it should have been. You'll want to plug in a proper mouse (or use a Bluetooth mouse) for any extended gaming sessions. The other issue I had was with the sensitivity of switches along the top bar, just under the monitor. Volume looks like it should be a dial, but it's actually just a (very sensitive) plus/minus switch. The whole bar is so sensitive that when brushing my hand along it gently to remove a stray cat hair, I managed to turn off the wifi antenna without realizing I had ever touched it at all. Since it's easier to control the laptop's volume using the keyboard, it's probably just smart to stay away from that area of the machine entirely once it's been turned on. Of course, look and feel are meaningless without performance. The specs are nice, with the i7 quad core Ivy Bridge CPU, the NVidia GTX 675M graphics card, and more RAM than anyone can actually use, but do they add up to smooth gaming? The Samsung came pre-loaded with a number of games, including Peggle, Plants vs Zombies, and Chuzzle. As much as I do in fact love PopCap games (I may have put more hours into Plants vs Zombies over the last year than is strictly healthy), they're not going to put a gaming machine through its paces. They don't even really put my two-year-old phone through its paces. It was time for something a bit more demanding. The most system-punishing game we have in the house, as it happens, is The Secret World. On my desktop, I run TSW on DX11, with most settings on the default "Ultra," and get an average of just over 30 fps. (The range runs from about 25 FPS to nearly 50, but during normal gameplay and combat hovers in the 32-35 fps area.) That's on a desktop using an Intel i7-930 quad core CPU from 2010 and an NVidia GeForce GTX 480. So how did the laptop compare? I turned the dial to "gaming" (more about that in a moment), set the game to "Ultra," and ran off to kill zombies. While puttering around Kingsmouth in solo combat it pretty much stayed in the 21-28 FPS range, which—while not exceptional—is actually a lot better and more playable than I expected. It doesn't take many tweaks to the settings to get it running around 30. Naturally, of course, the laptop sounds by that point as if it is trying to take off into space, but that's just how heavy-working laptop fans get. I mentioned the dial. The knob is the big gimmick of the Series 7 Gamer. Yes, a knob. It's a small dial set into the right side of the machine, just under the monitor, that basically has four pre-configured power management settings. There's a mode that optimizes gaming performance, naturally, but there's also a mode that reduces fan speed (making the laptop quieter) and dims the lights, so that the user won't be That Guy in a library or other quiet location. The gaming setting is effective. It brings the fan to life and makes sure that GPU has the juice it needs. But it's also, well, garish. Horribly garish. All of the lights switch to a bright, electric blue, except WASD, which go bright red. The volume and power switches, both round, also light up red and then pulse in sync with whatever audio source you have playing. By default, it also comes with a full Windows theme that changes your desktop and mouse pointer. Of course, the settings can be customized, so it's possible to keep the power boost while ditching the visuals, if they're not your thing. The other feature setting the Series 7 Gamer apart is its attention to audio, with Dolby sound processing. I threw some music on via the speakers to see how they sounded, and started out impressed. The treble and mid-range are actually very good, for laptop speakers. But as soon as the chord of Reaper in E Minor hit, they went all tinny and "blaaat." They may be very good for laptop speakers but in the end, they're still laptop speakers. With headphones plugged in, the sound (from games, music, or video) is as good and robust as you'd generally expect. So yes, the Samsung Series 7 Gamer makes a good desktop replacement machine. But its bulk and price point—just under $1900—are enough to invite the question of, "why?" If power is what a gamer is after, desktops are less expensive and can be upgraded more easily. If portability is what a gamer is after, there are similarly powerful machines, also less expensive, that can be picked up and hauled around much more easily. The number of players who need what the Samsung Series 7 Gamer has to offer is probably a small segment of the population. But for those who do need a 17" desktop-replacing, gaming-capable laptop, the Series 7 Gamer wouldn't be a bad choice.